I have been trying to set up a tank that will handle non-photosynthetic corals in a mixed reef environment. This means adding a lot of food. I don't have the personality to grow phytoplankton. Green water often requires too much cleaning of small tubes, handling lots of bottles and splitting of cultures only to find that the culture eventually crashes. I wish that I had the time and patients to do it right but I don't. Growing zooplankton would be a snap if I could grow non-fowling phytoplankton as food. I tried to grow rotifers several times in a bucket with various powders instead but I apparently was over feeding and using too much aeration so they always crashed on the third day. I had to mix fresh salt water to do water dilutions and get the solid waste off of the bottom every few days. Many people think that his is easy but I am very busy and I needed something even easier to maintain. I am now growing them in a 6 inch diameter, 6 foot tall clear plastic tube, with a funnel at the bottom. One quarter of the water must be changed per day to prevent fowling. 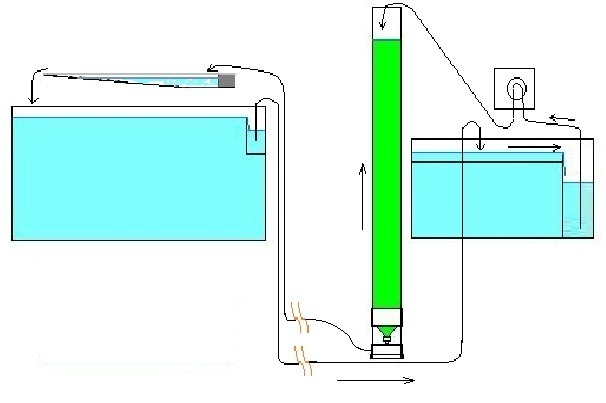 The rotifers are drawn off from the bottom of the water, along with any solid waste that settles out of column and is sent to the tank via a 1/4 inch tube. I figure that the main tank with the scrubber and all of the bottom dwelling critters can handle the waste much better than the tube can. 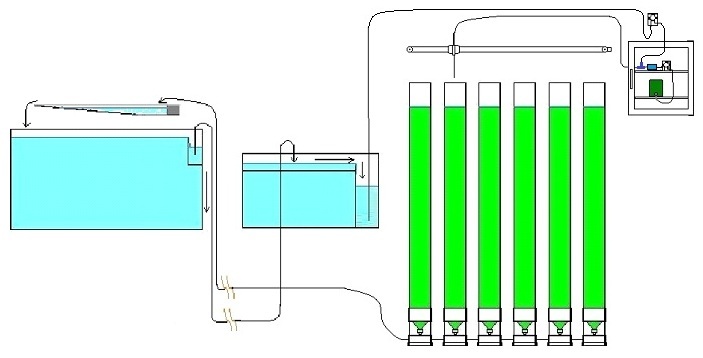 Replacement water is drawn from the sump by a peristaltic pump and is sent to the tower. I tied a coffee filter over the end of the tube that, comes from the pump so that it traps any larger critters that might contaminate the rotifer culture. I was told to use Rotifer Diet from Reed Mariculture and just make it slightly green, about like Mountain Dew and to cut down on the air as well. I did that and had success for two weeks. With that, I put 3/4 of the culture in the tower. The plankton tower has been working for a week and has not crashed. I just put in three squirts of liquid food in the morning and at night. My next step is to find an upper limit for the feeding and then start measuring the quantities that I use. Then I can hook up my other peristaltic pump to automate the feeding. If I get that far, I will need to put the food in a mini-fridge. NOW....In a perfect world, I picture having several of these towers sitting beside each other, in a row. I would have one each for rotifer L, S, and SS varieties as well as brine shrimp and reef bugs ...if not more. Of course that is wishful thinking but I must think ahead. First of all, I would like to get some feed back on how I could improve what I am trying to do. Second, I would like to know how you think the dead phytoplankton will be handled by my scrubber. While some things, like Reef Bugs, might need vodka, most of those towers would use the same food, concentrated green water that is not alive. Rotifer Diet is very easy to use and if I had 5 towers, for example, each would yield 2 gallons per day of rotifer water. There might be a lot of food for the zooplankton that doesn't get consumed by the little critters. I have a functioning system with a dump bucket style algal turf scrubber that has served me well for years, despite lots of over feeding of a wide variety of foods. 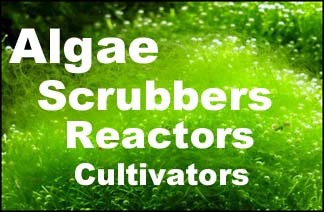 Scrubbers are great for over feeding but I am wondering about an abundance of that particular food and how it would effect the tank. Again, how do you think this system could be improved? Wish I could spend some time on this, but I have to build some scrubbers. Besides, the Reed people banned me from their azoo site, I believe because skimmerless-systems won't need as much food to be added. This is an interesting projekt, i would like to hear more of it like how it is going, an so on! The tower is going quite well and is stable so there isn't that much to report. I thought that it would crash by now and that if I could get a few weeks at a time, that would be great but it has chugged along very well. The population density is up, rivaling the high maintenance culture that I am keeping in a vat. I talked to the technical guy at Reed Mariculture. He told me not to use an air stone but to turn up the bubbles full blast. He thought that the rotifers can handle it and they will need the oxygen once I implement a few small changes that he suggested. I told him that I might want to build a bank of these towers but he felt that I might only need one or two. He told me that I should switch to their more concentrated bag that they sell by the liter. He said he does not normally recommend it because most people would over feed using that product. Feeding several more times a day, maybe more, maybe less in total, was also something that he felt would greatly increase the population density so I need to get and hook up a small, low output dosing pump and a good timer or timing circuit. Finally, he said that as I start increasing the population, I should start testing for ammonia until I get a better idea of how the feeding will affect the culture. I am so happy with the result of the tower that I want to pursue building a bank of them, not just for rotifers but anything that I can grow using this method. I would like to know what people thing might do well in these towers. First off, there are large small and extra small rotifers, brine shrimp, pods and mysis shrimp. Mysis are carnivores but perhaps if they are fed enough brine shrimp, I could grow them. I don't have to grow trillions. I just want the verity. One guy mentioned mysis that eat green water. I don't know if he was just misinformed. I try to fight getting way ahead of myself but to no avail. I have started reading up on automation kit boards and motors and I bought some already. I am now working on a motorized slide to move the two ¼ inch tubes that would feed the towers. One would be for the food and the other would be for the water just like the single tower is plumbed now. I could, more simply, use solenoids to switch the flow but the small amounts of viscose phyto-plankton would get clogged the tube. Well, that's an update. I just want an almost hands free plankton farm in my garage. I hope that I get more feed back. I'm sure that there are a lot of ideas that could make this project more stable, cheaper and simpler. Your scrubber will be fine with dead or live phyto or anything else going through it; it only cares about the inorganics. Looks fun. I thought of something similar last year but put it on hold. Why a tall tube... is there a vertical/gravity/separation function? It's that mad scientist look. You know, a row of tubes full of slightly green liquid with boiling bubbles in them. You can't beat that. No, seriously, it is closer to that axiom from professional sales training, if you have an issue/problem in your product, turn it into a feature. I had a tube laying around that I was going to use for a sulfer-denitrifier. I wanted to put it behind the tank and that is the amount of space that I had to work with. I decided that I would at lease put the denitrifier on hold after getting some advice on an unrelated topic. I was looking for something else to use it for. The main thing about the shape is the funnel at the bottom. I wanted something that could carry off the solid wastes that I need to deal with in a bucket. I was told to siphon it out periodically and that was a pain. I got the idea of the final shape from this picture in one of the articles that I read. It has and even sharper angle of the funnel at the bottom than the 45 degrees that I could find. The height is convenient for maintaining water levels in a gravity fed system. I also wanted as much volume as I could get in a reasonable space. I have seen those professional vats with a shallow angle of the funnel shape but they are exorbitant in price for a hobbyist and take up a lot of space. This tube went for about 40 some bucks and I can put a bank of them along the wall and still get my car into it's space comfortably. As I said before, with six towers, I have the freedom to grow different things or double and triple up on what I want. If I do get a crash in one of the towers, its not a big deal to take one of line, clean and restart it without and interruption in feeding so there is less stress associated with it. Now on the other hand, I have given some thought to cutting the tubes in half so that I don't have to get up on a kitchen stool to feed the tower. If I automate the feeding then hopefully that will not be an issue and the volume and leveling will be the winning factors. If I decide to go with the bank of tubes, I will redesign the base of the tube so that I can take every thing apart for cleaning. I didn't do that on the prototype because I didn't want to invest all the accurate machine work into something that might not work. I would need to use the technology that they use for various reactors on the market that have the flat plastic rings and a gasket, with plastic screws and nuts to hold them together. Instead of two plastic rings, I would need three, with 12 screws instead of 6 because of the issues with affixing the funnel to the tower. No It is close to a door with a top half window but that's is. I have read that putting a light in it would get the critters to waste their energy. I would like to see some pics of you setup if possible? I'm an engineer student from Iceland, and the reason why i am so interested in your project is that ther is no one breeding rotifers here in Iceland. Sorry for the belated update. I have expanded on my project. Now I am actively working on a 2 axis robot that can manage the feeding and water changes for six Plankton Towers. I have ordered most of the parts but things are progressing very slowly. I don't know if I can get this running right but it is fun. This is a video of my bench work so far. It is rough (just a pile of wires) but I have passed all of the hardest hurdles.